When I was 18 years old I was arrested for murder and put in a real prison for the first time. I hadn't been accused of or convicted of any crimes prior to that. That is, there were plenty of people who accused me, the police included. But the first murder marked my first time in prison, and it would be spend in solitary confinement under indictment for over a year while I awaited an actual charge - which eventually was never raised. But that part of the story was yet to come. I remember my first evening in this prison very well. The very first night I was being led through two wings into the farthest wing. It was an old prison, build sometime before World War II, and it had 5 floors. As we walked on the stone floor there was almost complete silence. I could hear no sound from other prisoners. The walls were a faint green color, the painting was falling off, and there were scratches here and there. Along each wall were doors every few steps (the picture looks very much like the prison I am describing, but apparently was taken in Poland or another Eastern European country). They were massive doors painted in a dirty whitish-grey color. Each door had a heavy locking device, attached inside the wall to a rod which ended in a round flat sign with the number of the prison cell that it was attached to. Whenever a prisoner needed help, or for other reasons needed the guards' attention, we had to press a 'tap' inside the cell a little distance from the door, and the rod would be released and fall down with a 'clank!' into a horizontal position, sticking further out from the wall and thus become visible from a distance. Even so it could take hours and hours before anybody bothered to come and check the reason why the prisoner had called. This was our only means of calling and getting in contact with the world from inside our cells. We spend minimum 24 hours a day in the cell. It was not a punishment, nor was it disciplinary or even security. It was just custom. It was how things were done. People sat here for even years without being charged, because that is how the system works in that state. The rod was attached to the lock in a way which made it fall down into the horizontal position when the guards opened the cell door. Each cell was a one man cell. Two man cells did not exist. All prisoners were kept in solitary confinement until they had been sentenced. This is still fairly common practice from what I hear. There was a small slit of sorts in the door itself through which the guards would look in at me on their rounds every hour, and whenever they happened to pass by in between their rounds. Sitting inside the cell I could see the eyes of the one who was peering in at me, but there was no way that I could look out or see who the person was or how he looked. It was only the eyes. At the opposite end of my cell was a small window high up under the ceiling. I believe there was approximately 3,5 to 4 meters from floor to ceiling. The idea with building it like this, I was told, was to make it imposing and intimidating to the prisoners. The walls themselves were over two meters thick, build of steel and concrete. The year when I was arrested was an unusually hot summer, and the city was baking in the summer heat. Nobody could tolerate wearing more than an absolute minimum of clothing, so I was in jeans, a sleevess T-shirt and a pair of thin jogging shoes when I was arrested. I had no coat, but a cop gave me his thin, short jacket, which made me wonder at the time since it was so warm I couldn't imagine I'd need any more clothes, and it was his private jacket that he gave me. That night I found out why. I was put in a cell at the first floor. There were no cellars underneath. In the cell was a thin bed made of some hard "wire" and a steel skeleton. I was given a blanket made of the most rough, itchy material I have ever experienced. But that wasn't the worst part. What would be an ongoing source of irritation was that the blanket was too short. There was no way I could make it cover both my feet and my chest. And when night fell it became freezing cold. The incredibly thick walls and the fact that light never really could enter made it very, very cold even in the heat of an unusually warm summer. I was led into a cage of sorts, with only an entrance at one end, and widening toward the outer end, with walls at both sides, and a wired fence on top and at the far end, which faced out towards a wall inside the prison. Ther was nothing to sit on, nothing to hold on to, I had nothing to drink, and at the entrance end was an armed guard who always seemed to be looking at me. I found it curious until I realized I almost always was the only prisoner who took the opportunity to get out in this small place for air. When they came and got me, I would go straight from the freezing cold into that hot, warm, cage where I could find no shade because they always got me within an hour before noon. Inside the prison itself I felt as if I was the only prisoner. 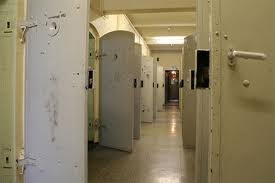 Because the walls were as thick as they were, and because everybody were so completely isolated from one another, I could only hear other prisoners when they were being walked through the wing for whichever reason. To see the doctor, to go to the interrogation room, and such. There was light in my cell 24/7. There was no toilet in the cell. Instead I was given a small bowl to do my business in, and it would be gathered every day after I had been given breakfast. I was given slightly warmed, think coffee every Sunday morning. One half filled battered faint yellow plastic mug. I've known a guy who was extremely violent, he'd break the skull of anybody who "disrespected" him, but sometimes it was like for nothing. He's been a couple years in jail, too. Weird thing is that he doesn't insult anyone, he's not charming, he doesn't manipulate people for no reasons. He doesn't bully anyone. Jail made him even more violent, that's why I stopped seeing him unless I had to in order to get things I wanted. He never seemed to regret anything, he doesn't care what people think about him and I have never seen him being scared of anything or anyone. Are those kind of guys psychopaths, too? Or are they just ASPDs? I would've written you if I knew where you were. I know no one can hurt you, but it would've been a nice feeling to show you have my support. I keep learning from you, your site is one of those I've learned most from. I'm happy that you're back. what's the difference between a jail and a prison? You use both words about the same place? I use the terms interchangeably when I talk about prisons which are used also as jails and vice versa. That's all there is to it. he doesn't seem like the typical psychopath. I think AsPD may play a role, but BPD could be closer to what's going on with him. On the other hand, the two do not rule each other out, he may have both conditions. I would have to know more about him in order to make a qualified guess. One question that comes to mind is whether or not he ever have been in love? How are his feelings for family members or family ties in general? How is he with friends? The first impression I got when I read your description is that he has anger and possibly impulsiveness issues. Both are common with AsPD'ers as well as BPD'ers. I live in that European state where Zhawq got arrested and was incarcerated, and I know he's telling the truth because it's standard practice here to keep people incarcerated under solitary confinement for one or two or even more years before they get to trial. And they don't have any idea about how long it'll take before they get to court during all that time. We have no bail system, so even those who are awaiting trial for minor offenses have no way of getting out while they wait. It is very common for people to get released directly from court after receiving their sentence because they've already served their time (and the judges are good at sentencing them so it fits with the time they've been imprisoned while awaiting trial). If you still aren't sure if this can be true, look up the home site of Amnesty International and other world organisations for human rights. It should be easy to find plenty of confirmations to Zhawq's claims. So where is this 'European state' that 'Zhawq' supposedly got arrested and incarcerated at, Mr. 'Anonymous'? Have you bombed the prison yet ? if you were inprisoned lifelong, would you commit suicide? My intuition tells me that there should be a way to do it consistently and without fear there is nearly no reason not to kill oneselve in that situation. How could a psychopath even survive in prison, especially in solitary confinement? I love to seek thrill in life, and prison would be the end of me because I feel like I can totally forget about my wonderful and thrilling ideas. If psychopaths like seeking thrill, how does one survive prison???!!! Ive heard that being by yourself is not the most pleasant of company. How did isolation affect you? Personally having my own company means I can ensure an intelligent conversation when everyone else seems so preoccupied with menial subjects.